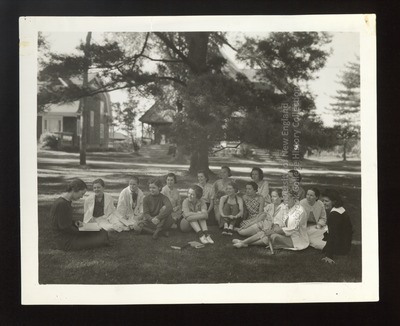 Fifteen Westbrook Junior College students are seated on the Green for an outdoor class conducted by Miss Constance E. Sterling, Assistant in Secretarial Science, and 1933 Westbrook Junior College graduate, in this black & white 1934 photograph by Kahill Photo Studios, Portland, Maine. The college girls wear springtime or early summer attire and lightweight cardigans. One girl wears equestrian gear, another shorts and camp shirt, and a third wears slacks with halter top. They sit with their backs to College Street. The Dow/Fuller home and the Johnson Faculty Club are visible across College Street. Back row, left to right: Olive Bowdoin, Betty Chesebro, Hester Charles, Josephine Sanborn, Bertha Borden, Beverly Nelson, Pauline Clement. Front row, left to right: Frances Cummings, Betsy Higgins, Jean Caldwell, Eleanor Letson, Mary Graham, Barbara Martin, Mary Langzettel, and Estella Kahill.